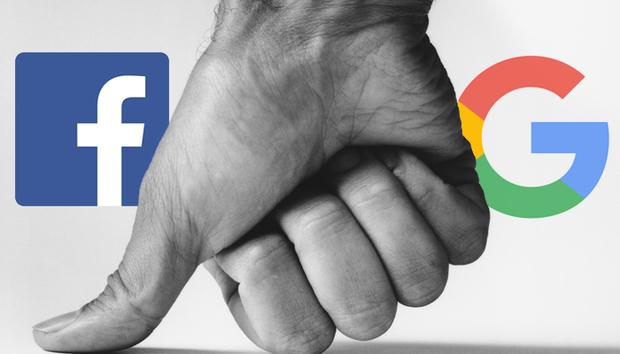 Google and Facebook are deepening the stranglehold they have on the U.S. digital advertising market. The companies' duopoly over digital ad revenue will grow this year as ad spending reaches $83 billion, marking a 15.9 percent increase from 2016, according to a new report from eMarketer. Google continues to dominate search engine advertising and Facebook's share of display and mobile ads is growing, according to the firm's latest forecast. Google is projected to end the year with 40.7 percent of the digital ad market in the U.S., while Facebook eats share from competitors to reach 19.7 percent of the market. Facebook's U.S. digital ad revenue is also growing more than twice the rate of Google's, according to eMarketer. Facebook is on pace to increase ad revenues by 32 percent while Google is expected to increase about 15 percent, the firm predicts. "Facebook's users are increasingly captivated by videos on the platform -- not just on Facebook, but on Instagram as well," eMarketer forecasting analyst Monica Peart wrote in the report. "Video, both live and recorded, is a key driver of growing user engagement and advertiser enthusiasm." Facebook's U.S. display ad business is projected to reach $16.33 billion this year and capture 39.1 percent of the market, as Google, Yahoo and Twitter are all expected to decline on the display advertising front. Google's share of the display market will drop to 12.5 percent on $5.24 billion in revenue, according to eMarketer's data. Meanwhile, Snapchat is in position for "explosive growth this year" with U.S. ad revenues jumping 157.8 percent to $770 million, eMarketer predicts. The company's ad business still pales in comparison to others, accounting for 1.3 percent of the U.S. mobile ad market this year. "Google's dominance in search, especially mobile search, is largely coming from the growing tendency of consumers to turn to their smartphones to look up everything from the details of a product to directions," Peart wrote. Overall, Google controls nearly a third of the U.S. mobile ad market while Facebook is banking almost a quarter of mobile ad spending.